My club has a few people playing in a Lion Rampant league, so I thought I’d jump in with some stuff I had sitting in the lead mountain. This is a 24pt mob of Bretons. 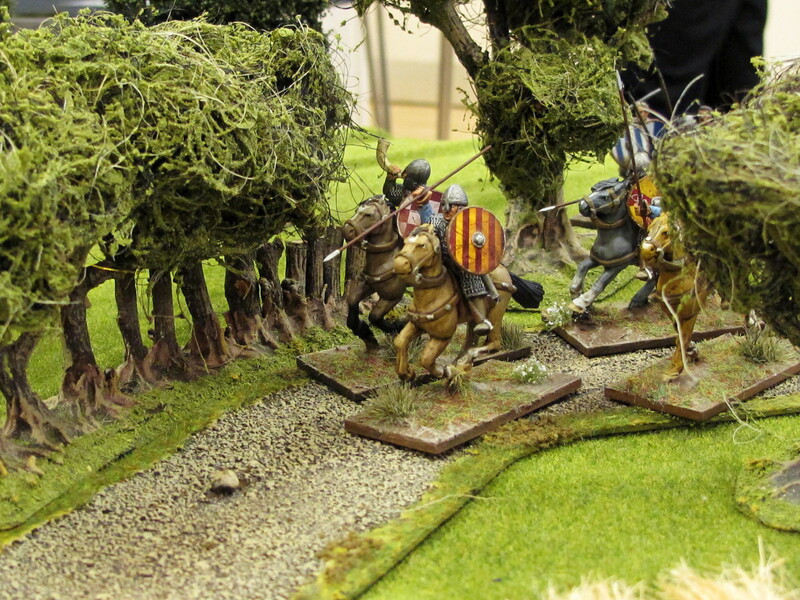 A lot of Lion Rampant retinues you see are towards the late Middle Ages (dudes in full plate with war hammers, armoured horses, etc), but the rules actually do cover all the way down into the 11th century, so there’s a bit of overlap with Dark Age gaming. It might look a bit odd having these guys duke it out with tin can knights, but I’m kind of jumping on my club’s Lion Rampant bandwagon. These miniatures were originally bought to form the core of a much larger Dark Age army for War & Conquest, which is still something I’d like to do when I get the time. I went for Mounted Serjeants over Men-at-Arms because I thought Serjeants was a better fit for more lightly armoured early medieval blokes. The Bretons were also known for their skill and discipline as horsemen, I wanted a more tightly controlled force that would hit-and-run and harrass the enemy. Mounted Men-at-Arms are actually pretty bad at manoeuvring, they’re all about sitting back and waiting for the moment to deliver a single devastating charge. The expert upgrade for the Yeomen allows them to shoot on the move, but unfortunately being 11th Century types they’ll be doing so with javelins not bows. That’s a bit of a sod to be honest, as they’ll have to get so close their “evade” rule has less effect. I might drop the “expert” bit and spend the points on another unit. The foot yeomen are pretty straightforward, they’re a big block of reasonably dependable foot to try and fix the bulk of the enemy army while the cavalry dance about. And the bidowers? Well they’re there to use up the last 2pts, and generally be an annoyance. The miniatures are a mix of Gripping Beast metals and Conquest Games plastics. I’ve ditched most of the kite shields and am using round shields with more British/Celtic designs on them to reflect their British heritage. Much of this lot are Norman miniatures, but I wanted them to look a bit different from Normans. GB do starter warbands for Saga, I managed to pick up an unopened Breton one cheap off eBay. These guys make up my Mounted Serjeants and one unit of Yeomen. The horses are a lot less chunky than the Conquest ones, and had a fair amount of flash on them. The unarmoured riders were similar, being quite flashy on their heads but not across the faces. The guys in mail were great, needing almost no work. The sculpts though are good, with plenty of character in them. I bought a bulk load of infantry and light cavalry off eBay, painted and based (for DBx?). The painting standard was ok-ish, and the bases were just slathered with static grass. I knew I’d have to re-base the infantry (they were based four to an element, and I needed singles) so I re-did the cavalry too so they’d match. These form both units of foot and one of the units of mounted yeomen. The sculpts on these plastics are, well, they’re ok but not great. There was no real highlight and shadow on these miniatures, but the basic colours were fine so I just dipped and varnished them and gave them a bit of a highlight where needed. Easy peasy. Bidowers in Lion Rampant are a small unit of peasant skirmishers. They’re handy to have, cheap and actually quite useful tactically. The unit size is only six miniatures and they’re armed with bows. I raided my bits box and managed to find some old plastic GW Bretonnian archers and a couple of human mercenaries built from the old Mordheim sprues. They’re low fantasy style, so passable for historical. They’re pretty massive, but I’m not too worried about that.